When six world renowned filmmakers – including Robert Redford and the late Austrian director Michael Glawogger – were asked to make short films for a television series about pioneering buildings of cultural influence, the results were never going to be boring. 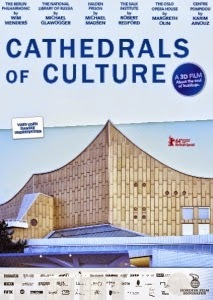 Cathedrals of Culture’s (2014) six 30-minute segments – gathered here as one film – are nothing if not thought provoking. The selection of buildings chosen for inclusion may seem a little odd. Though one can appreciate the presence of the Pompidou Centre – Paris’ famous hub for the arts, co-designed by the 1970s architectural enfant terrible Richard Rogers – that of Norway’s Halden Prison may seem a little more obscure. Is it really a cultural centre? Questions also arise as to why, with so many inspiring buildings out there, they included two musical centres – Germany’s Berlin Philharmonic building and the Opera House in Oslo, Norway – as well as two from Norway? How about the British Museum’s Great Court representing England – a country which has produced more than its fair share of culturally iconic edifices, but which isn’t mentioned here. That said those which are, are indeed mesmerising and undoubtedly socially influential. Russia’s National Library in Saint Petersburg – though dilapidated when compared with the other pristine buildings included – has a pre-Cold War archaicness, lending its dim corridors and miles of shelving crammed full with various dusty tomes. Viewing art can sometimes prove problematic. Anything more than half an hour in a gallery and you can be ‘blinded’ by the wealth of media on display; you may continue to take in the experience as a whole, but start failing to focus on individual pieces. The same goes for watching the stereoscopic Cathedrals of Culture. The various sections, when seen individually, are mesmerising – the hypnotic images of the buildings, their interiors and the people and things which inhabit them are engrossing if watched briefly for half an hour. Viewing them altogether, however, results in a sensation akin to sensory overload. Cathedrals of Culture is a wonderfully luxurious treat, but like a slice of rich gateaux, it should be sampled one slice at a time in order to truly appreciate the beauty of its individual ingredients. This review was originally published in October 2014 for the film’s theatrical release.